I'm an actress who studied at UCSD (UCLA's sister school in San Diego, Ca) and got my start even before that at Mt. San Antonio College. I jumped right into the Hollywood ratrace after college and after beating the pavement for several years, I decided I needed more control over my path and my artistic life. This frustration with "the biz" and it's tendency to make one wait to be chosen spawned the writing project DIMENSION. Being an actress, of course I had to play the three main characters in the podcast! I've written all my life and this re-focus towards writing has been the best medicine for me. The process for writing DIMENSION has been thrilling, feel free to ask me about it. The project as a whole has been life-changing and a dream come true. It is my pleasure to share it with you! The sand was hot. Increasingly so, as consciousness permeated my brain, convoluting my dream-state. I could feel areas of my skin growing unbearably hot as the sun inched towards it’s zenith. The shade diminishing as time went on. My eyes fluttered open and the sounds of water rushing and crashing filled my ears. Then I remembered. I was in Maui. With my eyes closed, I could have been anywhere. Experiencing time passing just the same, with nothing to hint at my location except for the increasing warmth of the day and the occasional breeze. There are many times in my life when I feel like I am spending all my time and energy running in place. Making the same effort towards the same goal with not much change occurring but somehow, time still whooshes by. One thing to address about Episode 3 and Henrietta’s arrival is that she and Shondra are cut from the same cloth, their arrival happened simultaneously, and the world they are in now exists in a separate time and place from their original lives from which they came. We do not yet know what the laws are of this dimension or how it might connect to other dimensions, if at all, but one thing we do know, is that time had to behave out-of-character in order for these two women to exist, and in this new place nonetheless. Whatever happened to them caused space and time to interact in a way that, at this juncture, cannot be explained. If we took Alice’s experience with the Queen and turned it inside out, (just to make it that much more confusing) we would have Shondra’s and Henrietta’s experience. They have traveled far but have not aged or grown. As though Shondra and Henrietta were running in place on the timeline of their lives and somehow still arriving somewhere different. Though, to say that they have not changed is not completely accurate. They were once one individual. Another point to explore in terms of how time and space needed to interact to produce this phenomena. According to Einstein we can measure time based on it’s relativity to other things. Relativity is the key word. I’m assuming you’ve heard the saying “It’s all relative”, and well,…it is. By all, I mean all. As human beings we measure ourselves and the world around us against comparable or complimentary themes. We are all looking for a sense of relevance. Within us along with around us. If the world within which we live doesn’t seem relative then we are uneasy and will make large efforts to try and alter our experience of it. We take huge endeavor in qualifying ourselves as relevant. It is how we know what is what and often how we decide who we are in society. Henrietta’s first interaction with this concept is Des. He observes her and questions who she is right away. She also asks for help from Des, deciding that he is trustworthy enough to provide her with some safety and perhaps navigation towards her own truth. Her own relevance. As I looked at the clearest of blue oceans crashing violently into the sand a few feet from me, I felt a sense of relief. I was able to step away from these expectations of relevance we put on ourselves when we’re functioning normally in our lives. It was okay to just sit there and think, or sleep or look at things. It didn’t matter who I was, or who I was trying to be. My expectation of how I spent my time was very different in Maui than it is in Los Angeles. It’s as if I was trying to isolate my experience of life from the usual way I chose to live it and become more relevant to the isolated island I was on. There’s even a guide of conduct on vacation that feels more relevant than another. It’s a constant play at adjusting our measurements of ourselves and our time with our surroundings. But one day the vacation is over. One day…you’re ready to go home. Have you ever glanced at a clock and the digital numbers quickly change to 11:11? Some call it a phenomena and others call it, well…a clock. I have talked about this occurrence many times over because I happen to be one of those people that swears this number pops up any chance it gets and I am always acutely aware of it. It hasn’t always been this way or at least I hadn’t noticed. I do remember when it began happening, quite vividly actually but more on that detail later. Numbers have had a significance in society on many levels for centuries and across cultures. Some of these significances are tied to language and sounds, some are tied to luck, while others are hugely spiritual. We now rely on numbers in Western society in which to base our systems. We rely on the binary system for our computers, we use math to solve almost all problems and when we can’t, we’re pretty uncomfortable with the idea. Numbers provide structure.“Numbers never lie”, a common enough phrase but after researching numerology it seems like there is plenty room for uncertainty. First of all, there are so many varying meanings attributed to each number across belief systems. If you want to dig deeper (which I always do) you can even find scientific margins of error in what an individual number’s value really represents. For example, there is an infinite value to the number two. The number two can be fractioned down into infinity. Most of us have heard of the Pythagoras Theorem back in algebra class, which was originated by the Greek mathematician Pythagoras who “believed that because mathematical concepts were more ‘practical’ (easier to regulate and classify) than physical ones, they had greater actuality” (Numerology wikipedia.com). He was one of the first mathematicians and a founder of Western numerology. It was sort of the birth of looking to number systems for defining our world. Beyond mathematical definition, numbers took on a spiritual significance during Pythagoras’ time. Though we now widely depend on numbers for practical use, the impulse to link them spiritually is still strong in many individuals and in some cultures as a whole. In Chinese culture the decision of whether a number has negative or positive connotations in relation to luck is based on sound. If the pronunciation of a number in Chinese sounds closely to a word in the language that represents an unlucky thing or idea, then the number is considered bad luck and vice versa for a positive connotation. Numerology.com states that “As the world becomes more computerized and dependent on numerical systems, the fascination with this ancient spiritual science only grows”. As I was researching numerology I came across this website: dimension1111.com. Ironic that this website is “eleven” focused and not only about numerology? Coincidence that my podcast series is called “Dimension” and this blog revolves around seeing repetitive “ones”? Of course, I have to click on this website. Fate wants me to, right? Once I did, I discovered that it was mostly about the phenomena of seeing 11:11. The website states that it “is a master number and represents inspiration, illumination and spiritual enlightenment”. For me this makes wonderful sense. It was back in 2011 (notice the year?) that I experienced the biggest heartbreak of my life. In trying to find the positive in the negative, I had begun to make a lot of spiritual connections. It was as if the ground beneath me was crumbling and I would have to re-pave my path. Lots of self reflection. In Episode Two of Dimension we see that two years have past since Shondra’s arrival in the desert. She also has to pave a new path for herself in order to reinvent who she is and create a new destiny. In one scene we catch her deeply reflecting while symbolically looking back at herself in a mirror. As in Alice and Through the Looking Glass, there is the wonderment of another world that might lie just beyond the mirror. Shondra feels like there is a world she came from that is forgotten and Alice longs to experience the other perspective. What Shondra doesn’t yet realize is that she is now part of the other perspective. She is already on the other side. Shondra can’t quite recognize herself in the mirror because she is now experiencing life ( in a new dimension) as a fraction of her previous self. In order to recognize herself again, Shondra will have to continue paving the path and walking on it in search for her identity. Recently I was rummaging through some old boxes of things I have packed away and I found a couple of notebooks I kept during the afore mentioned difficult period of my life. One was just for short reflections. On opening this one I flipped to the last quote I had written. The date was marked 1-11-11. It read, “The key to happiness might very well be intention. Live each day with intention”. Standing in the closet I felt an over-whelming sensation of synchronicity, self-reflection and meaning in my life. The timeliness of discovering this notebook contributed to feeling as though I was looking at the past me and the future me in the eye all at the same time. If somehow I could be watching over myself as some sort of angel, I suspect this is what it would feel like. An acute experience of past, present and future in a single moment. Maybe best described visually in the movie Interstellar when Mathew McConahey’s character is floating around in the fifth dimension. The movie I happened to watch the evening I experienced this phenomena, ignorantly not knowing the details of the film (a phenomena in itself, my being a science fiction writer). People often fantasize what it would be like to give a younger version of yourself a bit of the grace and wisdom you acquire only by growing older. In my case, reading my past words was a younger version of myself giving an older me advice but I ended up with similar results. It allowed me to see time as a whole and not broken into linear compartments. A moment in which all things past, present and future existed simultaneously. Could it be possible that Shondra has found herself in a dimension where she exists as many parts of herself at the same time? Could she be experiencing all of time? The website dimension1111.com had many explanations for the 11:11 sightings, one of the most extraordinary being this: “the 11:11 synchronicity often appears in lives of starseeds when during times of transition or when they are about to awaken spiritually to their purpose and mission on earth. A starseed is a human with a soul that did not originate on earth”. Could many of us be of a different galaxy all together? Is Shondra just a starseed that was reborn mid-life? Maybe we all have many versions of ourselves living and existing during many times in many places. Or maybe it’s all just a dead end search for more, when really all we have…is the present. Tick tick tick tick tick. I heard it. Unsure of where this unidentified sound was coming from, I listened for the pattern. Persistent and yes, definitely a ticking. I finally eased towards the guest bedroom where my boyfriend has a large black jewelry box on one end of the dresser filled with time pieces. Many of them antique pocket watches. He must have wound one before he left for work and decided against donning the vintage pendant, packing it back into its shallow drawer for me to find. Loosely keeping time with or without a witness. I say “loosely” because these old watches weren’t the most precise versions of time technology and actually lose time as they tick. Some really old models even lose so much as a full twenty-four hours. This collection of pocket watches ironically sits on the opposite end of my Alice in Wonderland collection. On the back corner of the large, dark dresser I have displayed a ceramic tea-set shaped in the form of each Wonderland character. There are pocket watch saucers with Chesire Cat tea cups atop them, a Queen of hearts tea pot, a White Rabbit milk container and an Alice sugar pot. I also have a decorative card deck that is specially rigged to build an excellent house of cards, two postcard sized framed milieus of the the Mad Hatter’s tea party (one vintage and one Disney), and last but definitely not least, I have a yellowing book entitled The Magic of Lewis Carroll. Outside of having written one of the most inventive, timeless, and valuable children stories of our time, Lewis Carroll was also a mathematician obsessed with riddles and puzzles. One question that troubled him for much of his life was this: where does the day begin? He would write letters to newspapers and government offices posing this question. He was curious about time and how it behaved. He was constantly questioning the relevance of fundamental math and science, which would explain the many conundrums Alice came across in Wonderland. The rules she had been taught in her few years of schooling were being very challenged by this strange collection of characters. There was the issue of time. During the mid nineteenth century, when Mr. Carroll was thriving, there were still many inconsistencies of time-telling methods. It was still mostly based on the sun, which varied from place to place and the idea of time zones was still just an idea. This became a large problem for train schedules and a push towards a more consistent and agreed upon telling of time was finally applied around 1884 once the industrial revolution was in full effect. In other words, the idea of time was not precise at all. As afore mentioned, even the timepieces that were carried around were far from accurate or reliable. Carroll’s irony of using the anxious White Rabbit to lead Alice towards a world that has fluctuating rules is very fitting. The White Rabbit repeatedly looks at his pocket watch, which we have just learned is far from reliable, and exclaims how late he is over and over again. Time seems to just pass and pass as the White Rabbit doesn’t get much closer to his destination. 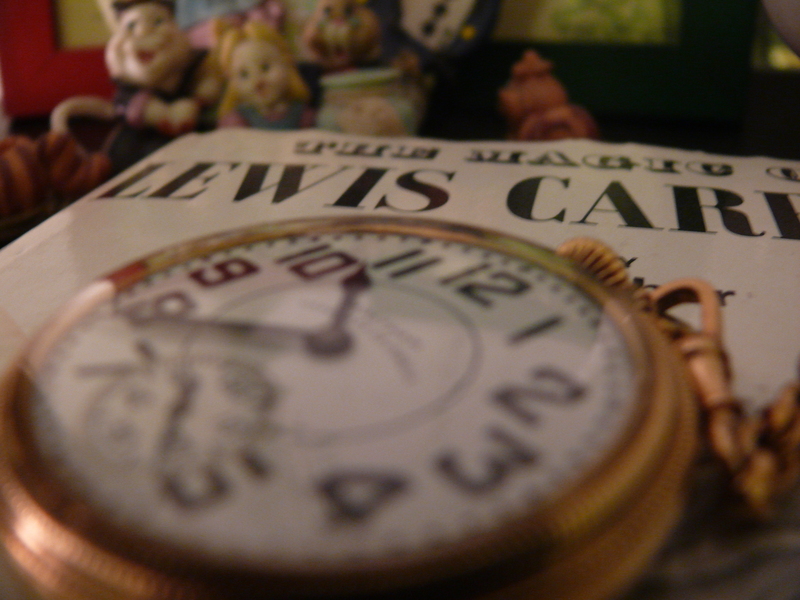 Lewis Carroll’s life and his stories about Alice are riddled with applicable themes. 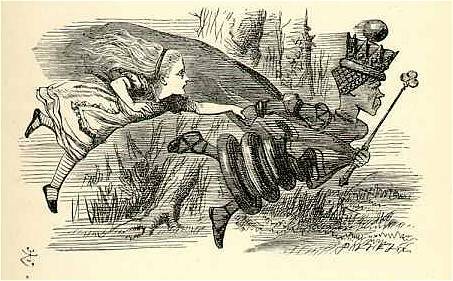 The Magic of Lewis Carroll points out, “that Arthur Stanley Eddington, in his book Space, Time and Gravitation, as well as lesser writers on relativity theory, have compared the Mad Hatter’s Tea Party where time stands still with the portion of De Sitter’s model of the cosmos where this is the case forever “(pg.26). My inclination to use Lewis Carroll as a reference for my exploration of themes and concepts in Dimension is no different. Especially when it comes to time. In the case of Episode One of Dimension we have a girl named Shondra who has arrived in a time and place unbeknownst to her. How can this happen? Due to Shondra’s lack of memory we can deduce that she was either in a bad accident or has somehow passed through time. Based on her appearance and the painfulness of her injuries we can point towards accident. Her sense of self is very convoluted however, and there are no signs of anyone else having been to the site in which she arrived. We can assume there were no foot prints in the sand from either herself or another person, no road in view, no disturbances to the surroundings at all. It’s as if she simply…appeared. Could it be that both of these things are true? That she underwent some sort of accident and she time traveled? Perhaps it’s the accident itself that has caused her to push through to another dimension. So what are the ways in which this could have happened? Shondra would need to find a way to travel faster than the speed of light in order to create a “tear in the fabric of the space-time continuum of the universe” (cyberboris.wordpress.com). Much like Alice’s fall into the rabbit hole, Shondra went through a passage of her own and ended up in a different world. “Down down down. Would the fall never come to an end?…I must be getting somewhere near the centre of the earth”. Though Carroll was toying with the idea of falling through the center of the earth, nowadays scientists wonder what would happen if we just fell forever in space or if it’s possible to fall through a hole that will take us to an alternate universe. One of the theories for this is called wormhole transportation. A folding of space and time causing two blackholes (from two different times) on either end to come together and touch. Now you have formed a wormhole. The worm hole spins, or should I say twists, from the two black holes on either end that are spinning in opposite directions at light speeds. The wormhole itself, or the “passage” results in traveling at faster speeds than that of light. This is what introduces the possibility of time travel or entering other dimensions. The speed. Of course, matter cannot travel this fast without being torn apart or stretched like spaghetti. This could be one explanation for Shondra’s feeling of “something missing”. She was torn apart but some of her cells and consciousness have managed to make it through the wormhole and come together to form a new body. She became a fraction of her original self once she arrived to the new dimension, being the reason behind her having no viable memory or identity. “Shondra” is basically a fragment of her former self. The accident or tragic occurrence she underwent is still a mystery and is a big part of what Shondra’s objective will be. What happened to her, how it happened and why? The same question man has been asking since the beginning of time (whenever that was). The questions that drive us towards invention, towards spirituality, towards war, towards science and towards philosophy. It’s what keeps us journeying towards a more meaningful existence. Towards answers.